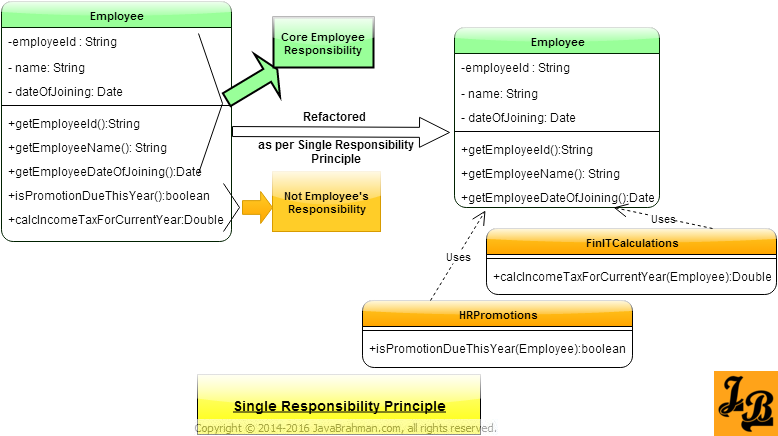 This article explains Single Responsibility Principle with Example in Java. What is Single Responsibility Principle: Single Responsibility Principle is one of the five principles of SOLID Design Principles. Specifically, the S in SOLID stands for Single Responsibility Principle. →A class should have only one reason to change. → A class should have only one responsibility. →A Responsibility is nothing but a reason to change..
What the definition means – When we design our classes, we should take care that one class at the most is responsible for doing one task or functionality among the whole set of responsibilities that it has. And only when there is a change needed in that specific task or functionality should this class be changed. Also note that the classes defined using the Single Responsibility Principle are inherently cohesive in nature, i.e. their structure – attributes & behavior – are specific to that single functionality only to which the class caters to. The above Employee class looks logically correct. It has all the employee attributes like employeeId, name, age, address & dateOfJoining. It even tells you if the employee is eligible for promotion this year and calculates the income tax he has to pay for the year. The logic of determining whether the employee is due this year is actually not a responsibility which the employee owns. The company’s HR department owns this responsibility based on the company’s HR policies which may change every few years. On any such change in HR policies, the Employee class will need to be updated as it is currently has the responsibility of promotion determination. Similarly, income tax calculation is not a responsibility of the Employee. It is the finance department’s responsibility which it takes care of the current tax structure which may get updated every year. If Employee class owns the income tax calculation responsibility then whenever tax structure/calculations change Employee class will need to be changed. Lastly, Employee class should have the single responsibility of maintaining core attributes of an employee. Let us now refactor the Employee class to make it own a single responsibility. This tutorial explained what is Single Responsibility Principle, then used an example in Java to show how this principle should be adhered to.